It’s all up in the air for Swansea’s James Lilley (6-4, 1KO) who is stuck in limbo following the withdrawal of his opponent Luke Osman. The middleweights were due to meet in a title eliminator with the winner challenging for the Welsh championship, which is currently held by champion Frankie Borg, in September. However, Osman withdrew from the fight and will instead face Cardiff’s Jimmy White in a four round contest on Sanigar Events’ ‘Repeat Or Revenge’ show at the Merthyr Leisure Centre on July 11th. 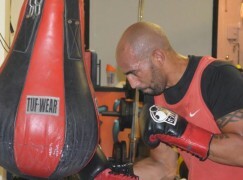 Explaining his decision to BoxingWales.com earlier this week, Osman said, “I’ve struggled to fit in all the training I need for a title eliminator fight. It’s hard with a day job and I’m not ready for it yet, to be honest with you. I’d rather have more rounds first and then build up to it. “I work on a construction site in the day, that’s 40 hours a week. I run in the mornings, go to work, come home to change and I’m straight to the gym to train. 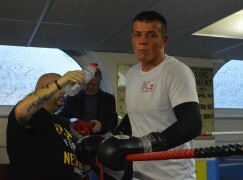 It’s not easy!” 27-year-old Lilley finds himself without an opponent and unsure whether his weeks of training at the Warehouse Fitness Gym on Northampton Lane in Swansea will go to waste. There are on-going efforts to organise another opponent, two in the frame are Matthew Ashmole and Gary Cooper, but time is running out with less than a week left until fight night. Lilley said, “I was a bit gutted about it when I found out (that Osman withdrew). It’s so close to the fight night, so I don’t know if I’ll still be on the bill. I’ve seen what Luke said but he’s had the same preparation and notice as myself. I drive an hour to work every day, I’m up at half past four in the morning to run, I go to work and I get home at eight o’clock in the night, I’ve got a one-year-old baby as well. “I think it’s a little bit unprofessional by Luke. You should know more than ten days before a fight whether you can do a ten rounder, you should know two or three weeks before it. I’ve got nothing against Luke, I don’t know him personally but if he’s not ready for it then we’ll just have to do it in the future. “The chance of a title, that’s what I’ve dreamt of since I started as an amateur. The one thing I wanted when I turned pro was to have a title – something I can reflect on, get in the history books and do something my children can look back on. Being a Welshman and winning the Welsh title as an amateur, that’s something I wanted to do as a pro.” £30 and £50 tickets for ‘Repeat Or Revenge’ on July 11th at the Merthyr Leisure Centre are available from Sanigar Events and Bristol Boxing Club on 01179496699. 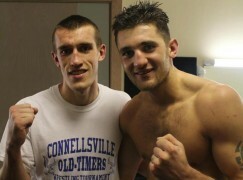 For more information, visit: www.westcountryboxing.com. It will be headlined by Dai Davies (10-23-2, 1KO) and Robbie Turley’s (13-4, 3KO) Welsh featherweight title rematch. In support will be Frankie Borg (8-2, 3KO), Craig Kennedy (8-0, 5KO), Alex Hughes (1-0, 1KO), Adam Goldsmith (2-0-1) v Stuart Brewer (1-0), Tony Dixon (4-0, 1KO), Dorian Darch (7-3, 1KO), debutants Kyle Jones and Ricky Rowlands. Image by Ciaran Gibbons.